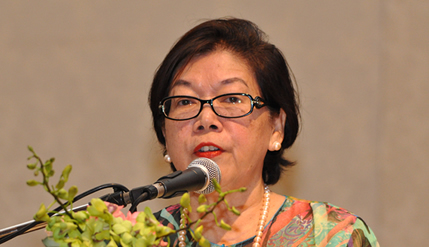 KUALA LUMPUR, 5 Oct 2012- Healthcare professionals have been urged to take over the leadership role in public health otherwise it will be steered by people who have vested interest rather than being passionate about it. The World Health Organisation (WHO) South East Asia Regional Office Representative, Dato’ Narimah Awin said it was not a question of position but about the health of the public. Healthcare professionals must overcome their inferiority complex of taking charge and become leaders of public health organisations. Dato’ Narimah Awin was speaking at the two day International Public Health Conference at the Renaissance Hotel here today. It was jointly organised by The National University of Malaysia (UKM), United Nations University and Malaysian Health Physician Association. The two day conference discussed issues of leadership in the Public Health Sector. Public sector health basically deals with every illness and medical related problems that affect the public. The problem is, who is actually leading and steering the field. This question is important because it deals with the fundamental issue of what is best for the patient in public health? She said at the international level those with money seem to have control over it since even the independent body working for the interest of public health are funded up to 70 percent by people who have money but unfortunately also have vested interest in health care. It would be acceptable if the provider of the fund is a philanthropist who is passionate about public health but there could be problems and conflicts of interest should the funders be businesses involved in public health. She said leadership in public health must be given to people who are dedicated and passionate about public health as they have a sense of purpose and mission. They will have no problem to contribute to public health even at the expense of their comfort as decisions in the public health sector may mean life and death to not just one but many lives. Leadership in public health should also be able to galvanise expertise. In the globalisation era, healthcare professionals and providers from all over the world should work together in carrying out research on public health. Such collaboration will not only benefit policy makers and health professionals but also the population as a whole. Present at the opening ceremony was Dean of the UKM Medical Faculty and Director of UKM Medical Centre, Prof Dato’ Dr Raymond Azman Ali, physicians, health professional and participants from the Asia region.